you ask why I perch on a jade green mountain? The final mystery is oneself....Who can calculate the orbit of his own soul? What I am I am, and say not. Being is the great explainer. This is an actual review of 4 new CDs, something I guess I should do more of given my lifelong interest in music. The title refers to an older generation's jazztalk to describe a female singer, specifically a girl who travels with a band---and in those days, that meant an orchestra of 15 men. In other words, a chirp is a jazz chick who sings...and clearly at first glance, as with much jazz slang, it looks neither complimentary or politically correct. Life on the road, particularly with a busload of men---even if every one were in superb emotional condition---is grueling work, and developing some kind of life with dignity in it is not always achieved. Perhaps because of this, and some of the casualties of such a life, to my generation lady jazz singers generally are treated with the highest respect we jazzfans can muster. Pretty much, guys my age have watched the art of jazz singing evaporate into memory. Not many men ever have tried it at all...except for some novelty numbers---and the first women to establish themselves risked healthy life and limb to do so. Over the last 30 years, most of the jazz singing one heard was some kind of recreation of or tribute to a style or song of the past. But suddenly there is an astonishing supply of young, breathtakingly talented women who seem seriously devoted to the music. And in the last few months, out have come a bunch of new releases to prove it. And I'm not even counting Norah Jones' new record. Many reviewers are comparing Karrin Allyson's "Wild For You" to Norah Jones. The material she's chosen certainly is pop-oriented and actually from the world of rock, and her voice might be considered similar and usually she sounds mellow and relaxed, as does Norah. Like the other performers in this review, she can play jazz on an instrument, accompany her singing at the piano, and is classically trained. The earlier singers in our history didn't have all that going for them. I start with Karrin because her album is lilting, easily accessible, and seems to be the one I've been listening to most often. 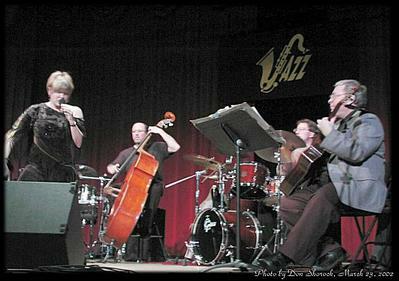 Karrin Allyson has been performing professionally for nearly 15 years, beginning in her hometown of Kansas City, where she borrowed money from her parents to pay a rhythm section and record her first album, which is called "I Didn't Know About You." She is serious and meticulous, for instance learning Portuguese when she wanted to record some bossa nova songs. Her releases increasingly have favored a jazz audience, with albums devoted to ballads favored by John Coltrane and "In Blue" which is loaded with jazz tunes. I kept waiting for a breakthrough CD of some kind. The first selection off the new "Wild For You" that I heard was on an allnight jazz show out of Seattle. The tune was Joni Mitchell's "Help Me," which is done not extremely unlike the way Joni did it but the rhythm underneath swings differently...and that delicious riff where we're remembering how good it feels to dance with the girl "with the hole in her stocking" turns into an extended guitar solo. It sounded wonderful and I had to have it...putting in a preorder for the album the next day at Amazon. As with the other jazz singers here, Karrin grew up on rock, always has included her own versions of popular songs in her performance, and now has put them together into a startlingly original tribute to these compositions. I was delighted to see a couple of Joni Mitchell songs get jazz treatment on the album, as the composer herself evolved, sometimes with self-conscious awkwardness, increasingly toward the improvisational music. There also are 2 by Carly Simon, one each from James Taylor, Cat Stevens, Elton John, Jimmy Webb, Carole King, Gene McDaniels' "Feel Like Makin' Love," and Ewan MacColl's "The First Time Ever I Saw Your Face." Most of the arrangements are by Gil Goldstein, but there's little augmentation on the recording to Karrin's own group. These tunes may be new to jazz treatment, but there's nothing new about adapting pop material to this music. Jazz musicians always have done this, sometimes using the barebones chord structure of a well-known song and building a new melody on top that they like better. Besides that, it's been singers who bring new ballads into the music. They go out, explore, and bring in the songs, which then the instrumentalists hear often for the first time and on which they begin improvising. Lester Young wasn't born with "The Man I Love" singing in his head; probably Billie Holiday taught it to him. If you'd like to hear what Karrin Allyson sounds like, she has tons of stuff you can download at her site. As near as I can tell, Jane Monheit doesn't have a site...and that's very surprising. She tends toward the more opulent and glamorous approaches than the others here, and I would expect her people would be out on the Internet playing all that up. She also has met the most resistance from the jazz world, with the increasingly hoary but venerable critic Nat Hentoff condemning her as not jazz at all. This at a time when we get a book from Gary Giddins about Bing Crosby, with assertions all around that Bing could have been a great jazz singer if he had wanted to be. Jane is the one of these 4 whom I've seen in person, and I must say I thought she'd do better in the Rainbow Room than an underground jazz club somewhere. And that's exactly where the latest album was recorded, before a posh crowd, with a big string section arranged and led by none other than Alan Broadbent, one of the premier jazz arrangers of our time. They don't play on all the selections, as she gets down with a smaller unit, but augmented by Ron Carter on bass, and Kenny Washington on drums. Those guys could swing a Mack truck through the Holland Tunnel, so they surely can move Jane---and they do. Jane is 27, and was born and raised in Oakdale, Long Island. The South Shore is not big jazz country, but it's close enough to New York for the bug to bite. At 17 she was in the Manhattan School of Music, and studying privately with Peter Eldridge, who founded an extraordinary jazz choir called The New York Voices, encouraged her further into jazz, and who accompanies her briefly on the new album (which also is available as a DVD I understand). A live album is tricky in every way for a vocalist, particularly with 31 musicians playing in back of you. Jane has wonderful intonation though (as do all of these ladies) and seems to need no help from sound editors. As for the material, it's all over the place, but includes her signature treatment of "Over The Rainbow," which I've never found interesting as a jazz number (even when Art Pepper or Stan Kenton have tried it) but she truly transforms it. She does a couple by Jobim, includes a Judy Collins' song, and almost nails Bill Evans' crushing "Turn Out The Stars." The song that Broadbent revived a few years ago, Jo Stafford's "Haunted Heart," is on the album, but the finale is what finally tore me up. It's a song I'm very susceptible to by Leonard Bernstein, called "Some Other Time." If you have songs that make you cry every time you hear them done well, you know what I mean. The Sony site advertises some soundbytes from the album, but they didn't work for me this morning. Her voice is luxurious, with a plaintive cry in it, that makes me think of a young girl standing on a beach, looking out to sea, and singing her longing. I like everything about Tierney Sutton, including how she writes: "My fourth Telarc CD is set for release and I hope you can hear all the sweat we put into this project. Love is an action, not an emotion and there is definitely love here... Of course the band is my usual group of untouchable, outrageous, brilliant, push me to the limit guys. Our jumping-off point was my obsession with the 1950s and 60s ballad recordings of Frank Sinatra---the dark stuff..." There are songs Sinatra sang that are so transformed by the master that I can't imagine anyone attempting them anymore. But these are precisely the songs Tierney heads for, as do the other vocalists here when they attempt Frank. Jonathan Schwartz, who knows the Sinatra catalog better than any man alive and whose father wrote "Dancing In The Dark" (included in the album), wrote the notes. That in itself is high praise for a singer not yet recognized by a lot of people. Again we have strings, but Tierney sticks with her trio, which has been with her all the way (whoops, and that song is in here too---done beautifully...and I've never liked Sinatra's version that much), and her pianist arranges them and conducts. Again the finale will tear you up: a medley of Cahn/Van Heusen's "The Last Dance" and "Dancing In The Dark." Tierney's version of "Dancing" is the only one I've ever experienced (outside of Astaire's choreography in "Band Wagon") where I actually felt I was dancing with someone. Of the 4, Tierney is closest to the jazz tradition, in terms of schooling, finding the gigs, and choosing material. A statuesque strawberry blonde from New England, she went to Wesleyan, then Berklee in Boston, on to New York, and then the trek to the West Coast. There she hung out with Jack Sheldon and Buddy Childers, and found her rhythm section. Her intonation is so perfect that sometimes it threatens to undo her. Jazzfans always are on the alert for too-much-technique, in place of creative invention, and Tierney's at risk for that kiss of death. She'll find the right note, hold it, and go for even more of the center of that tone than you thought was there. I love when she does it, but I can understand if others squirm a bit. She's made an entire album of pianist Bill Evans' compositions and other songs he liked to play ("Blue In Green"). She made another one completely of tunes jazz musicians wrote and love to improvise on ("Unsung Heroes"). I suppose the Sinatra album (titled "Dancing In The Dark" by the way) is the closest to anything commercial she's ever done. I imagine if it crosses over and becomes popular, she'll be criticized and abandoned for that too. About Frank she writes, "whose singing represents what great mystical art aspires to: both the light of reunion and the fire of separation. What more could we have asked?" Wow! I've written about Diana Krall before (sniffle, sob: [link] ) and by now most people have seen and heard her. Her marriage to Elvis Costello made headlines...BUT can they make music? "The Girl In The Other Room" is their first attempt at an answer...and for me here is the most inaccessible album of the 4. I'm hoping it just takes more time...following the lyrics, and listening more...but there is a quality of rock angst here that doesn't grab me immediately. Shafts of sunlight in an empty room, people staring into mirrors, having to change your address all the time, dropping the masquerade at last---I've heard all about this from rock musicians for 40 years...and I'm waiting for some depth to develop. One of the songs from the 2 of them is what got me to buy the album though, and that is "Departure Bay," which is about the death of Diana's mother. It's pure Canada, and breathtakingly beautiful. For jazz fans she does include a Mose Allison and has found Billie Holiday's old recording of "I'm Pulling Through." There also is a rip-it-up version of "Love Me Like A Man," that Bonnie Raitt recorded, which probably is a total show-stopper in concert. (Of course I'll never know that at 80 dollars a ticket!) To Diana's credit she's taking chances here...and that's what always makes a jazz album. This is not easy music...and it's pretty far from the glamour stuff she has been criticized for in recent releases. There's no pinup photography here. Hmmm, I'm talking myself into liking this CD better than I thought I did. Let me say one more thing about jazz musicians and singers. I mentioned before that maybe instrumentalists learn their ballads and standards when they back a singer on a record, or hear somebody sing on the radio. It's just a theory and I don't know whether it's true...but I do know that the lyric is what the singer must perform, besides working the chords and melody. There's a wonderful story about the tenor sax player Ben Webster...a man whose improvisations on standard ballads are among the most gorgeous ever recorded. This story may be evidence for that theory. It seems he just had completed a solo in a club, but looked thoroughly dejected and disappointed. A fan tried to cheer him up (which is a usually futile task many of us still attempt). He congratulated Ben on a terrific solo performance, and on how much it had moved him. Ben shook it off and still looked sad, so the guy asked him what was the matter. Ben Webster said simply, "I forgot the words." 24 Feb 2008 @ 13:25: What's With Hillary? 26 Jun 2006 @ 11:14: So You Think There's A Right To Vote?